Great Free Spins Feature Win on Fruit Farm Video Slot Game at Star Games! Discussion in 'Winner Stories - Online Gambling Winners!' started by Marina, Apr 23, 2013. 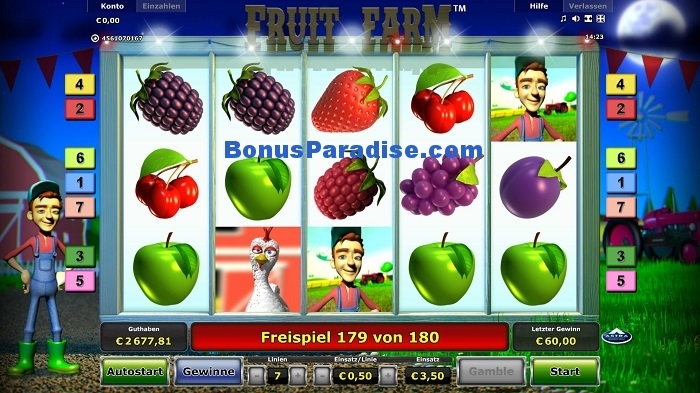 Since today is new slot game FRUIT FARM from Astra (Novomatic Group) Online at Stargames. Of course I had to give it a try this afternoon. I played around with my Bet, one time I play all 10 paylines, then again on 7 lines or on 5, also switched beetween the bet sizes, and it really took some time to finally hit 3 tractors which trigger the free spins feature. You get 15 free spins with all wins multiplied by 3 if you get 3,4 or 5 tractors. 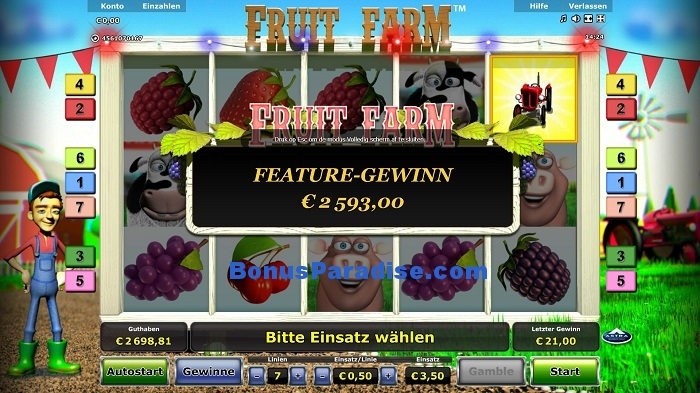 I got the free spins feature on Fruit Farm with a total bet of € 3,50. I could not believe it, but I kept getting retriggers. At the end I had a total of 180 Free Spins. This nice free spin feature paid €2593!!! Really really nice! I cashed out some of this to my Neteller!Thank you for another great online slot Stargames. OMYYY 180 Free spins??! That's just fantastic!!!!!! Congrats on your win Boss! Whahoo! This really is a great slot.